Identification of new born baby’s is one of the main tasks of the medical team following birth. Especially in developing countries , where security in public maternity wards is not very tight, and overcrowding is common, the risks of a baby swap or kidnap are above acceptable. 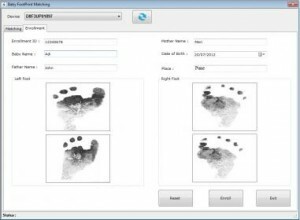 Reliable and fast methods for identification of new born baby’s were made available and used inside maternity and hospitals, as well as on airports or bus stations. New born baby’s fingerprints cant be clearly captured , palm print recognition is not suitable for new born baby’s yet since it is often difficult to let a newborn open his hand. Although the DNA examination is proven to be efficient in the univocal identification of individuals , but it comes at high cost and can’t be used in real time applications , demanding sophisticated laboratory procedures. Reduced size of the newborns ridges, which are three to five times smaller than on adults. Image acquisition is fast , so reduces time for capturing footprint image. 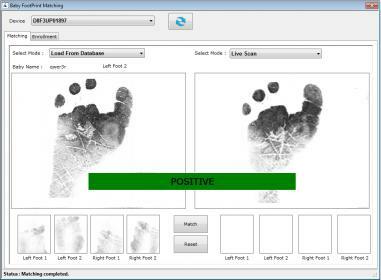 More reliable than other types of newborns footprints identification. If high resolution scanner used to scan ,greater resolution would yield better results. ENROLLMENT : When a new baby born’s , register that baby in the local database with the basic details and foot prints. Enrollment ID :- a unique ID for baby. Baby Name : – name of the baby. Father Name : – baby’s father name. Date of Birth : baby’s DOB. Place :- baby’s born place details . 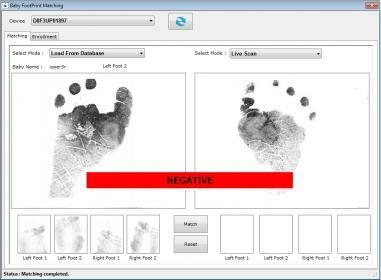 Biometric Data : Take two captures of each foot . (Left foot 2 and right foot 2). Click on “Enroll” button to save the data. 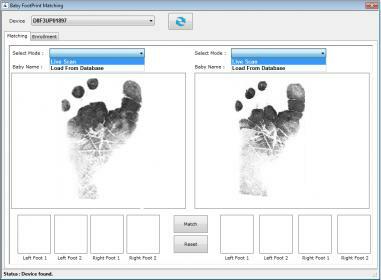 Matching : For Matching two different images of baby footprint taken . We can take this images directly from database or by live scan. Click on “Match” button , to verify baby footprints. Below is an eg. Where baby with name “qwe3r” is verified against his/her footprint . One sample is loaded from database and other is taken using livescan. In this article we presented a newborn footprint acquisition technique that uses a high-resolution optical sensor and provides very good identification rate.